According to predictions, Apple's new iPhone 6/6 Plus will likely break Samsung's records of selling 10million Galaxy S5 in 25 days, indicating an irresistible trend that millions of Apple fans will jump on board the iPhone 6 bandwagon and enjoy movies on its reportedly bigger-sized display. In consideration that you might run into iPhone video format incompatibility issues while watching videos, this guide focuses on the best media file formats for iPhone 6, so that you can have a hassle-free DVD video enjoyment on iPhone 6/6+'s high-resolution screen. Since the 4.7" and the 5.5" iPhone 6 (Plus) came to us, they received worldwide attention, with the most talked about being the 1334x750 and 1920x1080 resolutions. By shipping with new iOS 8, a 20-nanometer A8 chip that is more energy efficient and battery gains, the iPhone 6/6+ bring us a stunning visual feast experience. But the truth is iPhone 6, like the previous modules, is picky at file types such that you cannot import every video to it directly. As a result, having clear iPhone 6 supported formats in mind become inevitable. So what audio or video format can iPhone 6 play? If you still don't have any clue, let's go forward to know which media formats iphone 6 supports. The latest iPhone XS, XS Max and XR just arrived! Have a sneak peak of iPhone XS features right now. 1. Convert MKV, 360 VR video, H265, AVI, FLV, WMV to iPhone XS/XS Max/XR/6/7 MP4 MOV H264 HEVC, etc. 2. No.1 fast speed to convert video to iPhone, iPad, iMovie, iTunes, 360+ profiles. 3. Free download MKV AVI FLV HEVC video movie from YouTube, FB, Dailymotion, etc. 300+ sites to iPhone. Free Download Best iPhone video converter! 100% Clean & Safe! Despite there is no official iPhone 6 video and audio formats support list, you can still draw some conclusion about the general video format that iPhone 6 (Plus) accepts, based on the previous iPhone supported file formats. For the video or audio file that is not in the iPhone 6 supported format list, obviously, the best way is resorting to a video converter for iPhone to convert video to the format that iPhone 6, iPhone 7 or iPhone 8, iPhone XS/XS Max, XR recognizes beforehand. 1. High Efficiency Video Coding (HEVC), also known as H.265, which improves the data compression ratio for videos, thus saving a massive bandwidth and ensuring a 50% bit rate reduction at the same level of video quality. It's widely used for shooting 4K 60fps/30fps, 1080p 120fps/60fps videos on iPhone XS/XS Max/XR or others. 4. Motion JPEG (M-JPEG) up to 35 Mbps, 1280 by 720 pixels, 30 frames per second, audio in ulaw, PCM stereo audio in .avi file format. Sometimes, videos are unplayable on iPhone 6 or newer version, partly because the files saved in the file extension like SWF, MKV, FLV, WMV, MTS, etc are out of iPhone supported format list. But in some cases, you will be surprised when you cannot play MOV, MP4 or M4V on iPhone 6 (XS/XS Max/XR), though these file formats are said to be compatible with iPhone 6. That might be video codecs to blame. A typical case might be the AVI files. Officially, iPhone 6 including other iPhone models can play AVI file with Motion JPEG. But for AVI file with other codecs like Xvid or else, iPhone 6 (Plus) will sit by. Whatever that is, the video codec transcoding professor MacX Video Converter Pro will be your best aid for converting video to iPhone XS/XS Max/XR/X//8/7/6 compatible video audio formats at World's no.1 fast speed (Intel QSV supported). Not only it can convert any video like AVCHD, MTS, FLV, WMV, MKV, HEVC to iPhone XS/XS Max/XR/X//8/7/6 supported formats like MP4, MOV, M4V, as well as the audio file format supported by iPhone 6/6+ like MP3, but also you can save yourself a lot of time with the preset profiles for any generation of iPhone (including iPhone XS/XR) in this thoughtful iPhone video converter as you can simply choose the recommended iPhone 6 video and audio settings from the accommodated preset profiles. Step 1: Free download this Mac iPhone video converter and run it, click "Add Files" to load the video you want to convert. Step 2: Choose a format for iPhone 6, like MP4, MOV, or M4V, which is compatible for iPhone 6/6 Plus. 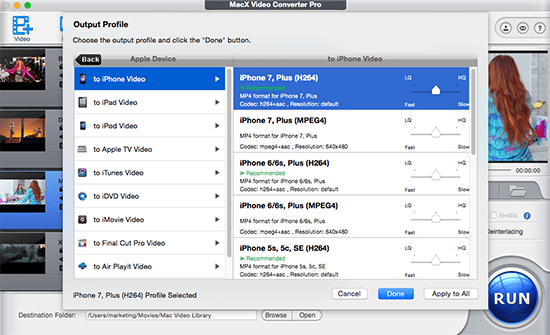 Alternatively, you can select Output Profile > Apple Device > to iPhone Video to directly convert to iPhone. Tips: MacX Video Converter Pro also offers you an one-stop solution to download and convert YouTube videos to iPhone 6/6S/7/8/X/XS/XR recognizable formats with high quality. Step 4: Click "RUN" button to start converting video to a format supported by iPhone 6. Note: Please do check the Intel box at the lower right part of the main interface, as it will enable the hardware encoding technology built into the second generation of Intel processor or higher, thus you can ensure the fastest possible speed ever. No matter what means you ultilize to get videos/movies, you need an extra step to copy videos from Mac/Windows to iPhone 6. MacX MediaTrans comes to rescue for this task. It's an excellent iPhone video transfer, not only importing iPhone supported format videos (MP4, MOV, M4V), but also MKV, AVI, M2TS, FLV etc. videos from Mac to iPhone. The built-in auto video conversion makes it possible to convert videos to iPhone 6 supported formats during transferring process. 1. Download MacX MediaTrans and launch it. Connect iPhone 6 to Mac with a USB cable. 2. Click "Video" icon and then "Add Video" to import your desired videos from Mac. 3. Click "Sync" to auto convert and transfer video from Mac to iPhone 6/7/8/X/XS/XS Max/XR. MacX DVD Ripper Pro: Working as the best DVD ripper for Apple iPhone to meet all your DVD backup and ripping needs. It enables you to rip DVDs (strictly copy protected DVDs) to iPhone 6 movie format like MP4, MOV, or other formats like FLV, H264, MPEG4, WMV, MKV, MP3, etc and directly convert DVDs to iPhone 6, including iPhone XS, iPad, Samsung, Sony, HTC, Windows Phone, etc without compromising quality. Besides, you can spice up your movie by cutting, cropping trimming and adding subtitles to better suit your iPhone 6 bigger screen. Possible iPhone 8 plays HEVC video natively on iOS 11? Not sure yet. The iOS 11 iPhone XS/X/8/Plus/7/6s/SE theoretically can play HEVC video encoded by iOS 11 camera app. When you import HEVC video from computer to iPhone 8/7, you might still need to convert HEVC/H265 to H264 if iTunes sends you an error message. How do you convert DRM M4V to MP4 mac and play M4V on Android tablet/VLC player? Firstly, select purchased iTunes M4V video on iPhone iPad iPod. Secondly, click Export button to transfer DRM-ed M4V video from iPhone iOS to Mac. Finally, the M4V video is automatically converted to MP4 during the iOS to Mac transfer process. What are iPad Pro (mini 4) supported file formats? Read the article and you'll figure out video formats for iPad Pro, and learn how to convert any video to iPad Pro friendly formats in a click. MacX Video Converter Pro provides world No.1 fast solution for iPhone users to convert videos to iPhone 6/6s supported video audio formats with 1:1 quality reserved.